There are many drawing and painting techniques anyone can learn in a relatively short time, but it takes dedication and effort to move beyond mediocrity. Years of working at it, not mere weeks and certainly not days. It’s a mistake to believe what an artist appears to do effortlessly was easy for them to achieve and ought to be for you too. Skill through practice makes things look deceptively simple. Think of art techniques as being to an artist what sentences are to a writer: a single, sensible sentence is relatively easy to achieve but putting sentences together to create a story worth reading takes a lot more dedication and practice. And before you have sentences, you have to learn the alphabet, vocabulary and grammar. So be patient with yourself, grant yourself time to learn, time to develop, time to make mistakes. If you start out with the belief that it should all come easily you’re setting yourself up for frustration and disappointment. Celebrate breakthrough moments when they happen, and keep striving determinedly between them. Compare how Monet painted the sea in his “Regatta at Sainte?Adresse” in 1867 (stiff, flat, static) and in “The Manneporte near ?tretat in 1886 (broken colour with movement). If your aim is to paint sea as in the latter, you’ve the advantage of being able to study what Monet did, but don’t expect to get there in an afternoon. 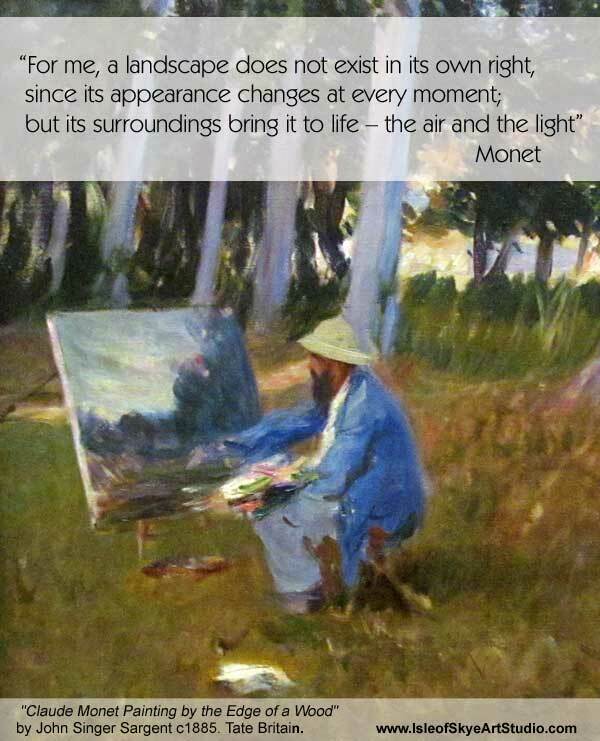 Monet had nearly 20 years’ practice between the two paintings. I’d like to have these 20 years for practice. But… you never know until you try.